Ben Alsop, Curator of the Citi Money Gallery at the British Museum, looks at objects in the collection relating to the female suffrage movement. Mary Lanchester (1864–1935), 18 June 1910. Women's Suffrage procession, with large numbers of women with banners marching along a London street. Colour woodcut, 1910. 1908 application letter from Sylvia Pankhurst to use the Reading Room. British Museum Archive. 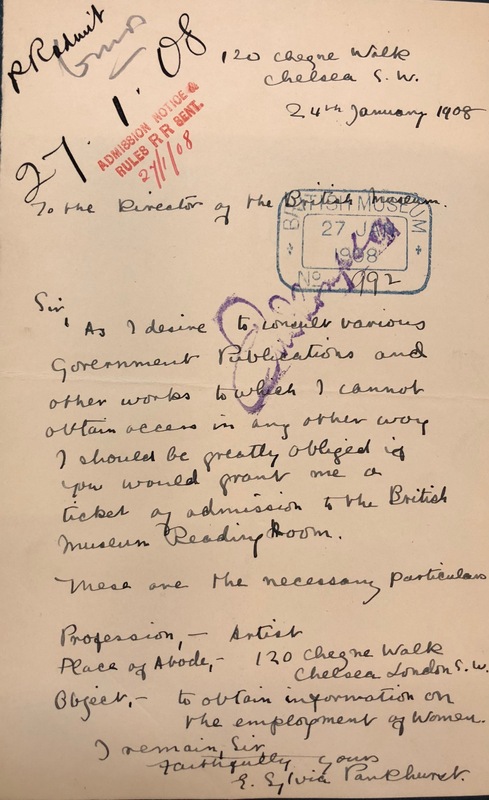 The successful application by prominent suffragette Sylvia Pankhurst, daughter of Emmeline Pankhurst, a founder member of the Women’s Social and Political Union (WSPU), neatly encapsulates the complicated relationship between the British Museum and the movement for women’s suffrage. As it housed the British Library (before it moved to Euston Road in 1997) the Museum was a repository for information which could be used to further the suffragists’ cause. However, the prominence of such an august institution also meant that it was a focus for militant suffragette action driven and directed by the WSPU. To commemorate the hundredth anniversary of the Representation of the People Act 1918, which for the first time allowed some women the right to vote, I’ve delved into the Museum’s collection to highlight some of the other objects that relate to the campaign for women’s suffrage. 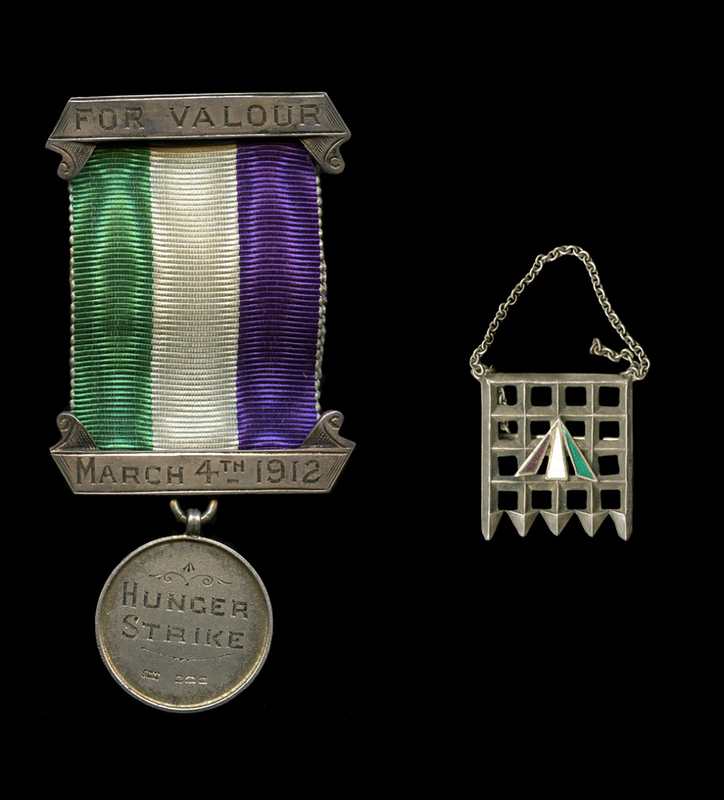 Hunger strike medal and portcullis brooch awarded to Joan Cather, 1912, both featuring the movement’s colours of green, white and purple. There doesn’t seem to be a great deal of information about who Joan Cather was or why she was imprisoned. What little is known has been detailed in a blog by Elizabeth Crawford. The counter argument to the rights of women to the vote is neatly embodied in a small enamel badge produced by the National League for Opposing Woman Suffrage. Formed in 1910 and given its primary goal, the group’s structure was peculiarly egalitarian, with its executive board consisting of seven men and seven women. At its height the group could boast a membership of over 40,000 with women accounting for five out of every six members. 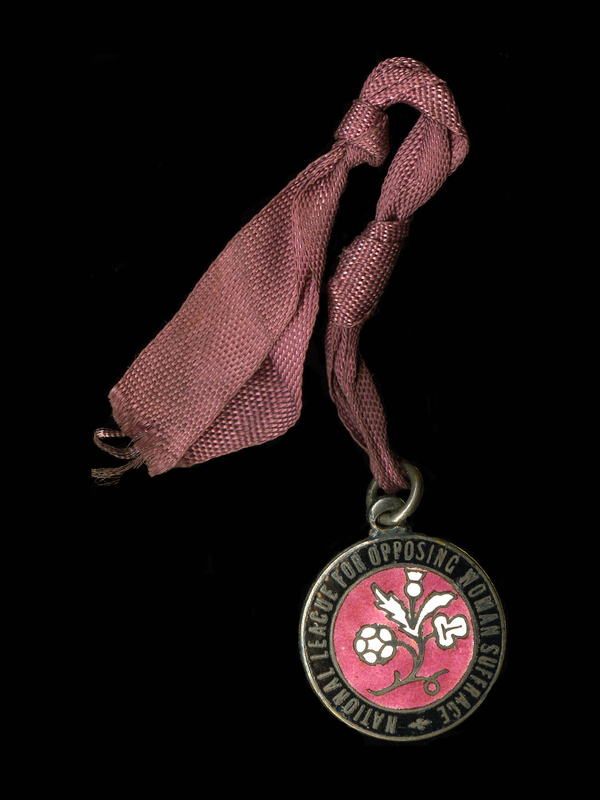 Metal badge and ribbon of the National League for Opposing Woman Suffrage, 1910–1918. Probably the best known object in the British Museum collection related to the campaign is the defaced penny currently on display in the Citi Money Gallery (Room 68). The penny was featured in the British Museum and BBC Radio 4 series A History of the World in 100 objects in 2010, and you can find out more about it in the programme itself. 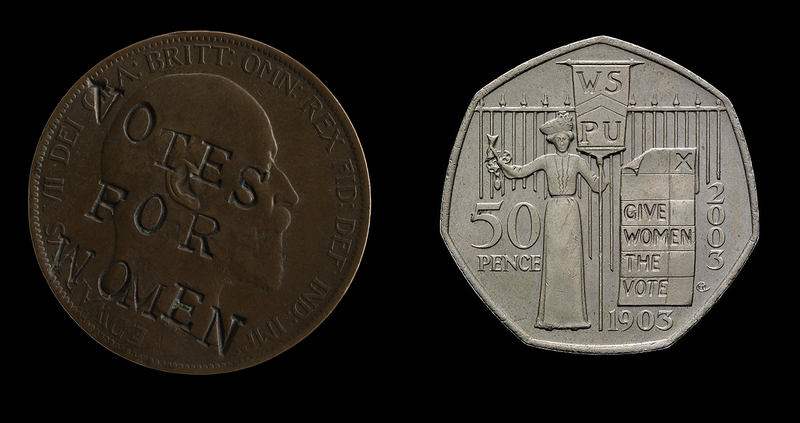 As an example of the societal change that has taken place since the defacement of the penny and rather wonderfully using the same medium, an official Royal Mint 50p coin issued in 2003 celebrates the creation of the WSPU. Suffragette-defaced penny minted around 1903, and a 50 pence coin from 2003 commemorating the 100th anniversary of the creation of the WSPU. Sylvia Pankhurst is not the only suffragette who sought access the Museum’s library. A letter from 1894 by former member of the WSPU and founder of the Women’s Freedom League (WFL) Charlotte Despard requests access to the Reading Room to consult local government regulations. Despard’s presence can also be found in the Department of Prints and Drawings which has the largest number of women’s suffrage related objects in the Museum. Despard is immortalised in a portrait print by Flora Lion, a well-known society artist of the first half of the 20th century. 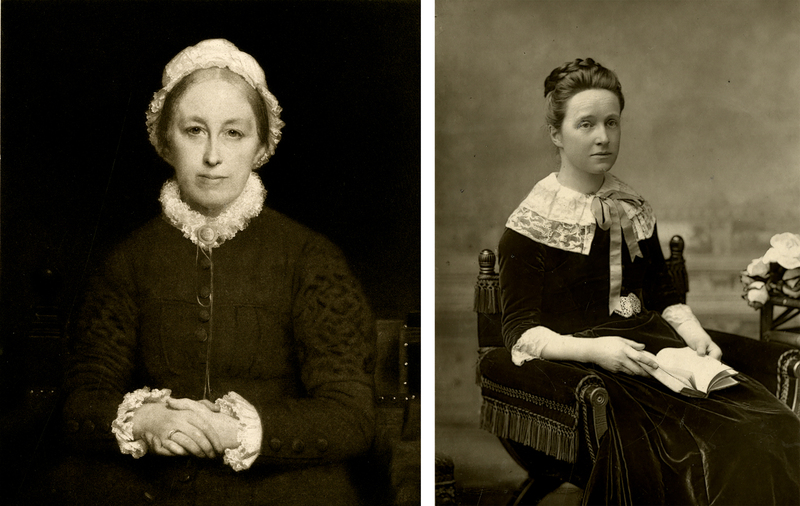 Photographic prints of Emily Davies and Millicent Fawcett. In a similar vein, there are photographic portraits of fellow campaigners for female suffrage, Emily Davies and Millicent Fawcett. Davies and Fawcett were committed suffragists, but they represent the more moderate strand of the movement, disapproving of the militant tactics of the WSPU, allying themselves instead with the National Union of Women’s Suffrage Societies (the NUWSS, of which Fawcett was president for over 20 years). The Museum’s collection includes not only portraits of women’s suffrage campaigners but also works by prominent campaigners themselves. There are a number of works by brother and sister Clemence and Laurence Housman – both vocal advocates for the suffrage movement and founders of the publishing collective the Suffrage Atelier, which described itself as an ‘Arts and Crafts Society Working for the Enfranchisement of Women’. Clemence, an illustrator and author, was a supporter of the WSPU and designed banners for the group. Laurence, a writer and artist, was a founder member of the Men’s League for Women’s Suffrage, formed in 1907. 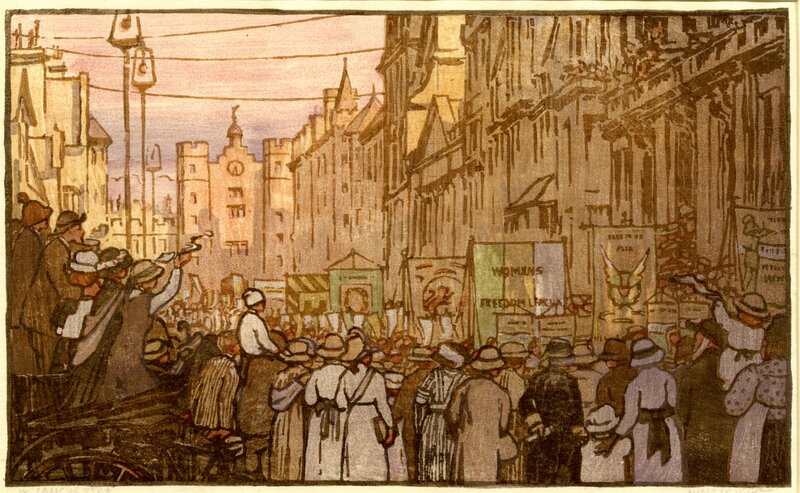 The type of banners designed and made by Clemence Housman, which accompanied the many thousand strong marches organised by the WSPU, can be seen in a print by Mary Lanchester. This work records a march that took place on 18 June 1910 – video footage of which can be seen in the BFI archives. Mary Lanchester (1864–1935), 18 June 1910. Women’s Suffrage procession, with large numbers of women with banners marching along a London street. Colour woodcut, 1910. Two prints in the Museum’s collection by male artists offer different takes on the state of the suffrage movement at two distinct moments in the early 20th century. 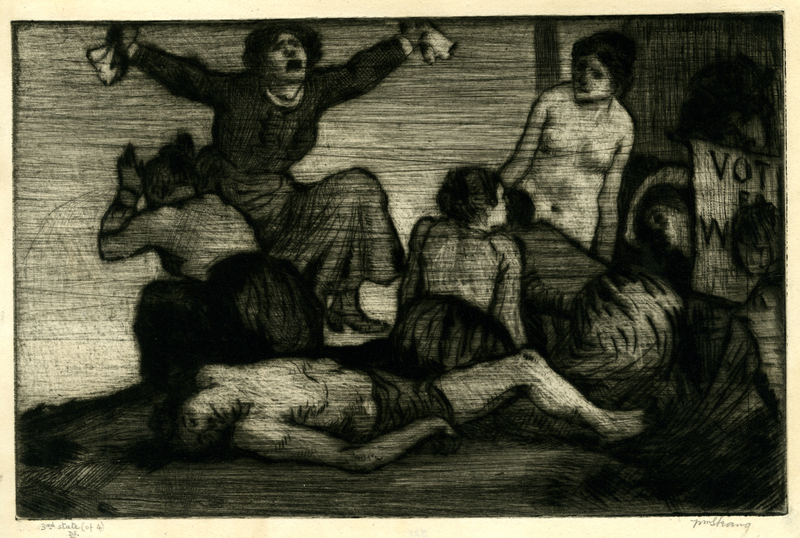 William Strang’s print of 1908 shows a distraught woman with arms outstretched as beside her lies a naked female body, the obscured slogan Votes for Women is just about visible on the right-hand side. William Strang (1859–1921), Votes for women. Drypoint, 1908. In contrast, a print produced in 1921 by Theodore Blake Wirgman, three years after the Representation of the People Act, shows a victorious Boadicea (after Thomas Thornycroft’s statue in Westminster) holding a Votes for Women banner as she is crowned by a winged figure. 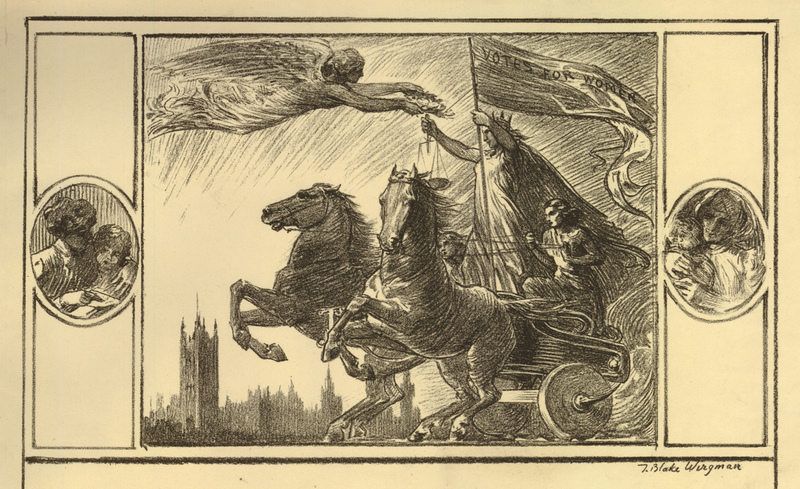 Theodore Blake Wirgman (1848–1925), Boadicea’s chariot in London, featuring a flag saying ‘Votes for Women’. Lithograph, 1921. Finally I want to highlight a couple of objects which are directly related to two of the suffrage movement’s most iconic figures. The first is a drawing from 1995 by American artist Jacqueline Morreau showing the arrest of Emmeline Pankhurst. The picture takes as its inspiration a famous photograph of Pankhurst being arrested in 1914 after attempting to present a petition to King George V.
Jacqueline Morreau (1929–2016), The arrest of Emmeline Pankhurst. 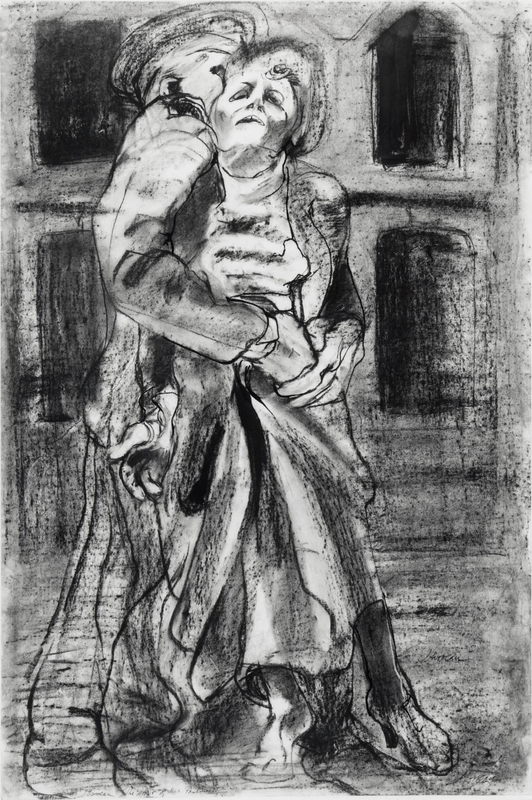 Black and white chalk, charcoal and black ink, c. 1982. Reproduced by permission of the artist’s estate. The second and final object isn’t actually in the British Museum’s collection at all. A sari once owned by Sophia Duleep Singh is kindly on loan from Peter Bunce and on display in the Sir Joseph Hotung Gallery of China and South Asia (Room 33). Singh was the daughter of an Indian Maharaja, and she dedicated much of her life to the campaign for women’s rights in the UK. Living in a grace and favour apartment in Hampton Court Palace, she was often seen selling copies of the Suffragette newspaper outside the palace walls. 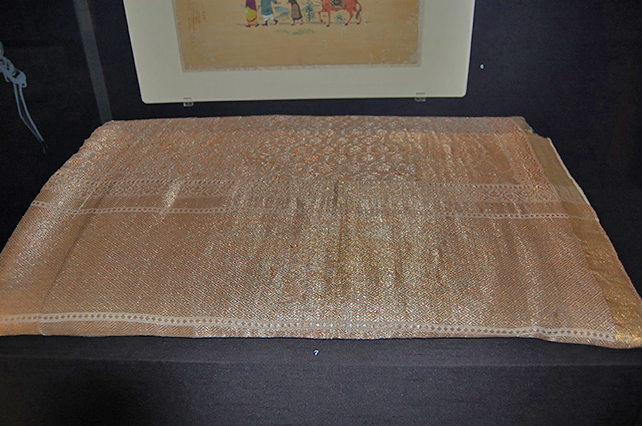 The sari of Sophia Duleep Singh on display in Room 33. On loan from Peter Bunce. Although the British Museum does not hold a particularly large collection of objects relating to the women’s suffrage movement (the Museum of London is the place to go for this) what is held here offers an interesting snapshot of the times. These objects, while often related to particular individuals, are in fact testament to the verve, dynamism and dedication of a mass movement.